Division D Spring Conference 2013 was held at Kawasaki on Apr.21st. 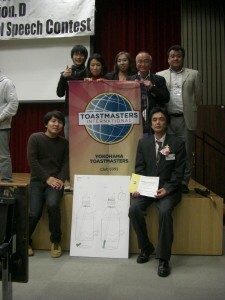 This is very important contest because a ticket for taking part in District 76 Conference is given to 1st place winner!! From our club, our president TM M.T joined this contest as a contestant. He inspired audiences using his patent product!! Unfortunately, he couldn’t get a place. But I thought he had high confidence and he gave his speech with his own style. District 76 Spring Conference 2013 will be held at Nagoya on May 16th – 18th. Some YTMC members including me will join this contest! 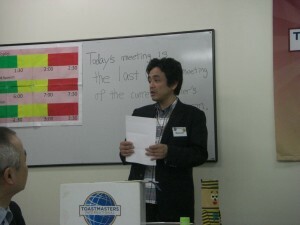 The 457th YTMC regular meeting was held at Hatoba kaikan on Apr. 20th. So officers, let’s enjoy remaining term!! Today we had a special guest. 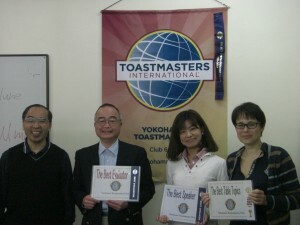 She is Toastmasters in Paris. Wow!! Then she was assigned to evaluator suddenly, and she took table topic speaker. So I’m sure she enjoyed our meeting! In the next meeting, we have a plan of election for deciding next officers. It is most important event in our club. The venue is Gino-bunka-kaikan. Not Hatoba!! Please be careful.